The court denied plaintiff's motion to reconsider the court's earlier ruling that defendant did not infringe under a theory of divided infringement pursuant to Centillion Data Sys., LLC v. Qwest Communications Int'l, Inc., 631 F.3d 1279 (Fed. Cir. 2011). "In Centillion, the Federal Circuit held that 'to 'use' a system for the purposes of infringement, a party must put the invention into service, i.e., control the system as a whole and obtain benefit from it.'. . . The Federal Circuit found that Qwest's customers put the claimed invention into service even though they used their own computers to trigger processing in Qwest's servers. . . . In contrast, Qwest did not put the invention into service. Like [defendant], Quest makes the back end processing elements, but it never 'uses' the entire claimed system because it never puts into service the personal computer data processing means. Similarly, [defendant] makes the back end processing elements, but it never 'uses' the entire claimed system because it never puts into service the display of said source data stream. The user must click on a hyperlink in order to display said stream." The court denied defendant's motion for Rule 11 sanctions and issued a show cause order against defense counsel why he should not be sanctioned for multiple meritless sanctions motions. "Rule 11 sanctions are reserved for instances where, unlike here, 'it is patently clear that a claim has absolutely no chance of success[.]'. . . Defendant asked three times in the span of one month for the Court to sanction Plaintiff for bringing its complaint. Then, Defendant used [a] supplemental brief . . . as a platform to ask once again for Rule 11 sanctions. All of these requests have been procedurally improper and baseless." The court denied defendants' motion to reconsider the issuance of a TRO pending plaintiffs' appeal and rejected defendants' argument that "a likelihood of success on the merits is a prerequisite for issuing a TRO." "I agree with defendants' argument in the normal course, i.e., when I am asked at the commencement of a case to evaluate its merits. . . . Under the circumstances at bar, however, I conclude that this factor switches from having a gate-keeping function to simply being one of the four factors to be considered when granting or denying an injunction. . . . [A] grant of a TRO post-trial merely preserves the status quo pending appeal; it does not change the status quo as it would at the commencement of a case." In granting plaintiff's motion for attorneys' fees under 35 U.S.C. § 285, the court rejected defendant's argument that "the purpose for an award of attorney fees has already been accomplished through the sanctions and enhanced damages ordered by this Court. . . . While [defendant] argues that it 'has already paid a very heavy price for the accused conduct and there is no reason to further punish [it] by awarding attorneys’ fees,' the Court would like to emphasize that an award of attorney fees is awarded as compensation to a prevailing party when the Court finds the case to be exceptional, and not because the Court seeks to punish the other party." The court stated that it would not impose certain changes to its docket and discovery orders despite the fact that plaintiff had sued 95 defendants across 7 cases. "The Court has previously expressed concern about cases where a plaintiff asserts questionable patent claims against a large number of Defendants to extract cost of defense settlements. . . . This however is not one of those cases. Although [plaintiff] asserted the same patent in multiple cases against numerous Defendants and previous cases settled before proceeding to the Markman hearing, [plaintiff] is distinguished by its litigation history. . . . [Its] preparation for the status conference, readiness to provide detailed infringement disclosures, and in camera information regarding the reasonableness of its settlements does not raise the Hobson’s choice concerns that other cases have raised for the Court." Defendant's motion to transfer venue was granted and the court rejected plaintiff's argument that a mandatory stay pending resolution of an ITC investigation precluded the court from ruling on the transfer motion. "[Defendant] argues that the motion to transfer does not fall under the purview of 28 U.S.C. § 1659(a) because the motion does not address a 'claim' or 'same issue' involved in the ITC proceeding. The Court agrees with [defendant's] interpretation of the statute. It would make little sense for the stay to encompass proceedings related to procedural matters that are not before the ITC. The legislative history of § 1659 shows that Congress intended that the stay affect merits issues that involve 'questions of patent validity, infringement, and any defenses that might be raised in both proceedings.'" Plaintiff's motion to compel the production of defendant's licenses was granted as to "in-bound" and "out-bound" licenses, but denied as to cross-licenses. "Plaintiff has shown the relevance of In-Bound license agreements that include patents relating to semiconductor testing (such as the [defendant's] patents-in-suit) from the 2003-2007 time-frame. Thus, that information shall be produced. Similarly, in regard to the Out-Bound licenses, the court orders that [defendant] honor its agreement to continue its efforts to produce the additional license agreements limited to specifically identified patent agreements. However, as to the request for Cross-licensing agreements, the court finds that request to be overbroad and unduly burdensome and, in light of 'the tenuous relevance of the cross-licenses compared to the in-bound and out-bound licenses [to be] produced', such a request is denied." The court dismissed plaintiff's qui tam false marking action on the basis of the settlement of an earlier filed false marking case involving the same patents and products and rejected plaintiff's argument that the settlement "was 'staged' and lacks transparency" because the settlement terms weren't publicly available. "While it is unclear if public disclosure is required to finalize a qui tam settlement and voluntary dismissal with prejudice . . . [d]istrict courts in the Southern District of New York and Northern District of Illinois have determined that the government maintains a sufficient level of control over qui tam actions brought under Section 292(b). . . . [Plaintiff] refuses to acknowledge that the government received the settlement documents, which included the amended complaint alleging false marking of the [patents-in-suit], reviewed them, and then approved the . . . settlement. . . . The dismissal with prejudice [of the earlier-filed case] precludes this case." The court granted defendant's motion to dismiss for failure to state a claim and concluded that plaintiff's patents did not satisfy the transformation prong of the machine-or-transformation test under In re Bilski, 130 S. Ct. 3218 (2010). "The [patents-in-suit] claim processes involving the extraction of information entered into and stored in a document or file and the formatting and transmission of that information to an application program. . . . [T]he data at issue in the [patents] does not change forms -- it is merely transferred from one format -- a document or file -- to another -- the application program. The data itself remains the same. As a result, a transformation cannot be said to have taken place as a result of the patented process." Glory Licensing LLC v. Toys "R" Us, Inc., 2-09-cv-04252 (NJD May 16, 2011, Order) (Hochberg, J.). Defendants' motions to transfer venue under the first-to-file rule were granted in part as to one defendant who had filed an action in the transferee forum one month before the instant case was filed. However, the court denied the motion as to two defendants who were not parties to the first-filed case. "The Court appreciates that given the same patents are asserted in all three cases, there is a potential for overlap regarding claim construction issues, infringement issues, invalidity issues, and unenforceability issues. However, given that the Court will sever [the first-filed defendant] from the present case, the risk of inconsistent rulings as it relates to the specific parties is significantly decreased. Moreover, the Court finds that the plaintiffs in the second-filed cases should not be rewarded for the procedural hooks they attempted to create with their respective filings." The court granted defendants' "motion to compel a finding of waiver" of the attorney-client privilege as to plaintiffs' motivation for seeking a reissue patent. During a deposition, plaintiff's in-house counsel "expanded on the statements to the PTO, revealing that because of the issue of the different effective filing dates, there was a specific concern that the mixed subject matter claims were technically anticipated by [plaintiff's] publication of [another application]. [He] further indicated that communications between himself and other in-house and outside counsel led to this concern, or at least were the means by which the concern was expressed. The Court is persuaded that these conversations constituted confidential attorney-client communications concerning the reissue application, and that the deposition statements about the role of the PCT application therefore constitute a waiver of privilege." Following a bench trial on inequitable conduct the court determined that plaintiff's patent was not unenforceable even if prosecution counsel had intended to deceive the PTO. "Although any failures by [counsel] to carry out his client's instructions are attributable to [plaintiff] as his client vis-à-vis third parties such as the PTO, in balancing the equities, consideration must be given to the fact that [counsel's] inaction was in direct conflict with [plaintiffs'] directions. In addition, any inequitable conduct was not related to substantive patentability, but rather, to a procedural irregularity caused by the prosecuting attorney's failure to diligently prosecute in direct conflict with his client's instructions and without its knowledge." The court denied plaintiff's motion to compel the deposition of Steve Jobs, defendant's CEO, to testify concerning his public statements about the accused products' use of the allegedly infringing protocol such as: "One of the next frontiers for a seamless digital music experience is the car. We all spend a lot of time driving, and now this elegant solution lets iPod users enjoy their entire music collection in their BMW or MINI." "Plaintiff's sole support for its claim that Mr. Jobs has unique, non-repetitive, firsthand knowledge is that he must know about the statements because he made them. None of the cases cited by [plaintiff], however, support the broad proposition that the requisite knowledge can be established by public statements alone. Even if Mr. Jobs has personal knowledge of the years-old statements and even if they were relevant to this case. . . [defendant's] other witnesses testified fully and consistently with the 11 statements on which [plaintiffs'] Motion is based." The court denied defendant's motion for judgment on the pleadings as to plaintiff's false marking claim where defendant's product was marked with a Chinese patent application number that resulted in a differently numbered Chinese patent. In doing so, the court rejected defendant's argument that the false marking claim did not comply with the pleading requirements of FRCP 8(a). "[Plaintiff] specifically alleges that [defendant] has marked its deshedding tool with 'Patent No. 200620072629.8,' that this is not an existing US patent number, and that the tool is not covered by any patents owned by [defendant]. . . . Applying the proper standards, it is at least facially plausible that [defendant] could be liable for false marking when it marks its product as patented but the company does not own a patent that covers the product. Therefore, I find that [plaintiff] has met the pleading standards of Rule 8(a)." The court also rejected defendant's argument that the complaint failed to plead intent to deceive under the heightened pleading standard of FRCP 9(b). "This case is distinguishable from [a case] where the allegation was simply that a sophisticated business should have known when a patent expired. . . . [Plaintiff] alleges that [defendant] marked its deshedding tool with 'Patent No. 200620072629.8' when that product is not -- and has never been -- covered by any patents owned by [defendant]. Under these facts, [plaintiff] has sufficiently pled the elements of its false marking claim under Rule 9(b), and [defendant's] motion for judgment on the pleadings will be denied." On Appeal, That The Federal Circuit Will Find Constructive Knowledge Is Not Enough." Defendant's motion to dismiss plaintiff's indirect infringement claims for failure to state a claim was denied. "[Plaintiff] has only pled that [defendant] had 'constructive knowledge' - not actual knowledge -- of the patents through markings. The Federal Circuit recently suggested, in dicta, that constructive knowledge 'with persuasive evidence of disregard' for patent markings 'may perhaps' be enough to demonstrate knowledge for the purpose of inducement of infringement. In light of that indication in binding precedent just 15 months ago, the Court will not dismiss [plaintiff's] complaint against [defendant] on that basis. . . . [Plaintiff] bears the risk, on appeal, that the Federal Circuit will find constructive knowledge is not enough." Plaintiff's motion for a default judgment against defendants for failing to provide discovery was granted. "Defendants have not participated in discovery, but rather have refused to provide depositions or responses to [plaintiff's] written discovery requests. . . . The record is replete with evidence of willfulness. Defendants have ignored discovery deadlines and other obligations imposed both by the Rules of Civil Procedure and explicit orders of the Court. . . . [Plaintiff] has been unable to prosecute its claims and defend against Defendants’ counterclaims. . . . The Court has already imposed less drastic sanctions, ordering Defendants to pay [plaintiff's] reasonable attorney fees in connection with the earlier motion to compel. . . . [Plaintiff] is entitled to a default judgment in this matter." Belwith Products, LLC v. Seema Warwick Hardware, Inc., et. al., 1-10-cv-00724 (MIWD May 4, 2011, Order) (Jonker, J.). Defendant's motion to exclude portions of plaintiff's noninfringement expert's testimony was granted where the court concluded the expert's opinions were based upon a mistaken construction that "a" referred to a single computer instead of "one or more." "At points in the [patent-in-suit], the article 'a' is present in a claim containing the transitional phrase 'comprising.' As such, it is subject to the general rule that 'a' or 'an' carries the meaning of 'one or more.'. . . [G]iven the claim construction clarifications provided in this order, [plaintiff's expert] will not be allowed to offer a noninfringement opinion that is based upon his assertion that a 'principal market maker computer' means a single computer operated by a principal market maker." Defendants' motion to sever plaintiff's suit involving eleven defendants and four patents was granted. "Plaintiff has not alleged that the Defendants have engaged in the same transaction or occurrence or series of transactions or occurrences. Rather, Defendants are accused of infringing the patents in similar ways, but not as part of the same transaction or occurrence or series of transactions or occurrences. Each Defendant operates differently and offers products that often compete with those of other Defendants. Joinder is thus improper under Rule 20(a)." The court granted defendants' motion to exclude expert testimony on consumer surveys that "quantify the estimated value of consumer preference for internal antennas in cell phones." 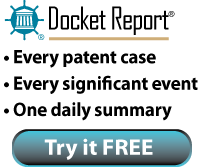 "While Plaintiff claims that its experts contend that the patents-in-suit are 'fundamental' to internal antennas, the surveys are not tied to the alleged advantageous technical characteristics of the patents-in-suit. Put another way, the surveys do not measure how consumers value the purported advantages provided by Plaintiff’s technology. . . . [Such evidence] confuses the issues and must be excluded." However, the court cautioned that "survey evidence demonstrating that consumers generally prefer cell phones with internal versus external antennas may be relevant if Defendants open the door to such a comparison. For example, if Defendants contend that a particular external antenna is an acceptable noninfringing alternative, evidence of broad consumer demand for internal antennas may rebut the acceptability of external antenna as an alternative." The court denied defendant's motion for judgment on the pleadings that the false marking statute was unconstitutional. "[T]the government maintains a sufficient level of control over qui tam actions brought under Section 292(b). . . . [T]he law obliges the district-court clerk to apprise the Director of the PTO -- a member of the Executive Branch -- 'of an action under' Title 35 of the U.S. Code. 35 U.S.C. § 290. . . . A qui tam action for false marking arises under Title 35, and so the Court determines that, contrary to [defendant's] argument, the Executive Branch receives notice of qui tam false-marking claims."